Summary: Aging and reclusive Hollywood movie icon Evelyn Hugo is finally ready to tell the truth about her glamorous and scandalous life. But when she chooses unknown magazine reporter Monique Grant for the job, no one is more astounded than Monique herself. Why her? Why now? Monique is not exactly on top of the world. Her husband has left her, and her professional life is going nowhere. Regardless of why Evelyn has selected her to write her biography, Monique is determined to use this opportunity to jump start her career. 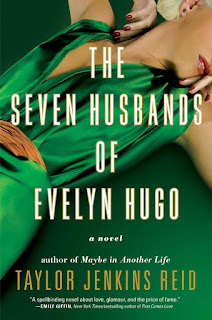 Review: The Seven Husbands of Evelyn Hugo gives all kinds of Elizabeth Taylor vibes. Seven husbands to Liz's seven, eight if you count her two time marriage to Eddie Fisher, puts Evelyn right up there in the big leagues of Hollywood leading ladies that loved them and left them. So when Monique is given the chance for a once in a lifetime interview with Evelyn, she jumps at it. But why does a movie star like Evelyn Hugo pick a relatively unknown black writer for her final interview? Through twists and turns, long days and nights spent with the reclusive Hugo, it's not readily apparent. I initially resisted reading this book because I like to focus on stories about people of color. So it was a shock to find that both Monique and Evelyn were. That brought a little more comfort to my reading, but beyond that, Jenkins Reid has written a fascinating look at the life of celebrity. Even at 400 pages, it was a quick read that drew me in from the beginning and held my attention in the two days it took me to read it. If you need something lighthearted, perhaps a beach read, be sure to check this one out.